Essendon will be encouraged by the allround performance of Jonathan Giles and midfielder Jackson Merrett, who collected a team-leading 27 disposals and four clearances. Two familiar names lead the way for St Kilda, Leigh Montagna (27 disposals) and Jack Steven (22 disposal and one goal). Small forward Jack Lonie collected 17 disposals, five score assists and one goal. BEHIND BombersAnthony Tipungwuti scores a behind from a Stoppage. GOAL SaintsJosh Saunders scores a goal from a Stoppage. GOAL BombersShaun Edwards scores a goal from a Turnover. Former Cat Mitch Brown (Essendon) leads all players after halftime in disposals (14), marks (six) and rebound 50s (four). GOAL SaintsJosh Bruce scores a goal from a Turnover. Ahmed Saad (St Kilda) leads all players on the ground with eight disposals inside forward 50. First year player Jack Lonie (St Kilda) has also performed well with six dispoals inside his forward zone. In regards to scores from turnovers, St Kilda have managed 15 kicking 8.7, whilst Essendon have six scoring shots for a return of 5.1. BEHIND SaintsJosh Bruce scores a behind from a Turnover. BEHIND SaintsMaverick Weller scores a behind from a Turnover. RUSHED BEHIND to Saints from a Turnover. BEHIND SaintsLuke Dunstan scores a behind from a Stoppage. Jonathan Giles has been one of Essendon's top contributors, not just in front of goal (3.0) but at stoppages too, leading all ruckmen in hitouts (17) and hitouts to advantage (five). GOAL SaintsJack Lonie scores a goal from a Stoppage. GOAL SaintsDarren Minchington scores a goal from a Turnover. GOAL SaintsAhmed Saad scores a goal from a Turnover. Jack Lonie with three of the last four inside 50s for St Kilda. St Kilda have ten players with one goal each whilst Essendon have four goalkicker's so far, Giles (three) and Edwards (two) the only players on the ground with multiple majors. GOAL SaintsTim Membrey scores a goal from a Turnover. 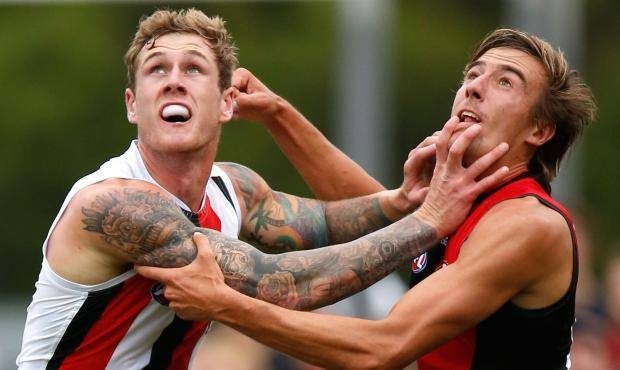 After 167 interchanges last week, St Kilda are on pace for a similar number this week. At three quarter time they have had 122 interchanges. In comparison, Essendon have only had 86. 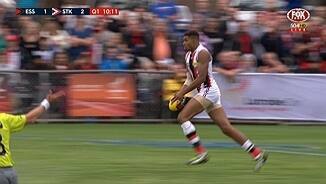 Scoring shots from 40 metres and beyond, St Kilda 3.4 to Essendon 0.1. 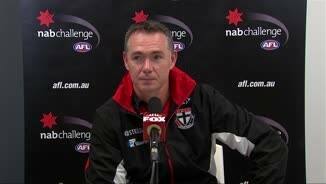 St Kilda InterchangeDavid Armitage was changed with Luke Dunstan due to an injury. Essendon have kicked four goals to St Kilda's three this quarter, this is despite Essendon trailing 108 in inside 50s. GOAL BombersJonathan Giles scores a goal from a Turnover. Essendon InterchangeAaron Heppell was substituted for Jordan Schroder. GOAL SaintsDarren Minchington scores a goal from a Stoppage. 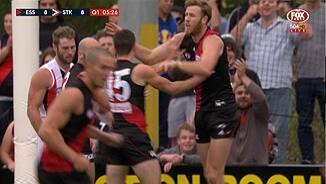 Essendon InterchangeJason Ashby was changed with Mitchell Clisby due to the blood rule. Young Saint Seb Ross has been substituted for the game. He was one of St Kilda's best collecting 14 disposals at 86 per cent efficiency, four clearances, four tackles and a goal. 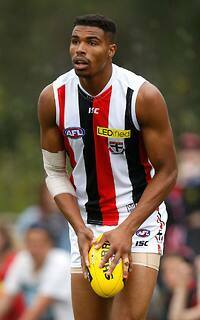 St Kilda InterchangeLuke Dunstan was changed with Sebastian Ross and is possibly out for the game. Essendon InterchangeShaun Edwards was changed with Shaun McKernan due to an injury. Two former GWS Giants lead Essendon in goals today with Jonathan Giles and Shaun Edwards both kicking two each. GOAL BombersJonathan Giles scores a goal from a Stoppage. BEHIND SaintsTim Membrey scores a behind from a Stoppage. GOAL SaintsJack Sinclair scores a goal from a Stoppage. Saint Jason Holmes showed promising signs in the first half, collecting 10 hitouts (three to advantage) in just 21 minutes of game time. GOAL SaintsBlake Acres scores a goal from a Turnover. Essendon InterchangeMitchell Clisby was substituted for Sam Tagliabue. GOAL BombersShaun Edwards scores a goal from a Stoppage. St Kilda were able to punish Essendon on the turnover in the second quarter, scoring 4.0 after only managing 0.3 in the first. St Kilda InterchangeJack Sinclair was substituted for Sean Dempster. Two two up players lead Essendon in disposals, Clinton Jones with 13 and Marcus Marigliani with 12. Of the AFL listed players, Jackson Merrett has 10. After a steady first term, Leigh Montagna stamped his influence on the game in the second, collecting 13 of his 20 disposals, whilst disposing at 90 percent efficiency. St Kilda have kicked the last three goals, stretching their lead out to 21 points, the largest of the game. GOAL SaintsSebastian Ross scores a goal from a Turnover. St Kilda were only able to manage two goals in each quarter last week versus Brisbane. After kicking two goals in the first quarter today, Jack Steven (16 disposals) ensures the streak is over, kicking his side's third of the quarter. GOAL SaintsJack Steven scores a goal from a Turnover. Acting Essendon captain Paul Chapman leads all players on the ground with 232 metres gained. GOAL BombersElliott Kavanagh scores a goal from a Turnover. Disposal numbers between the two sides are identical (109) but the style of each team is coming out in the numbers with Essendon enjoying a 3421 advantage in marks, whilst St Kilda have a 46-30 advantage in hand ball receives. GOAL SaintsCameron Shenton scores a goal from a Turnover. BEHIND SaintsAhmed Saad scores a behind from a Stoppage. Despite being down 3327 in contested possession, St Kilda have a 10-5 advantage in clearances. Clinton Jones (Essendon) maintains his strong start finishing the first quarter with 10 disposals, whilst Jack Steven (St Kilda) finished the quarter well with nine disposals. Both teams have managed three scores from turnovers, with the advantage to Essendon 2.1.13 to St Kilda 0.3.3. 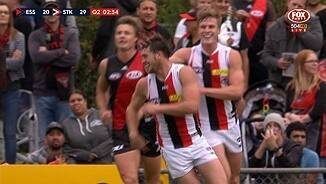 Both teams have managed three scores from turnovers, with the advantage to Essendon 2.1.13 to St Kilda 0.3. BEHIND SaintsJarryn Geary scores a behind from a Turnover. GOAL SaintsPaddy McCartin scores a goal from a Stoppage. Essendon's mini run of the last three forward 50 entries, netting 2.1, is ended by 2014 NAB AFL Draft first overall selection Patrick McCartin who goals from a strong lead. GOAL BombersJason Ashby scores a goal from a Turnover. Essendon InterchangeJames Magner was changed with Josh Freezer due to an injury. BEHIND BombersKyle Langford scores a behind from a Turnover. After scoring 0.2 from their first four entries inside 50, US basketball convert Jason Holmes kicks the first goal of the game. After scoring 0.2 from their first four entries inside 50, US basketball Jason Holmes convert kicks the first goal of the game. GOAL SaintsJason Holmes scores a goal from a Kickin. BEHIND BombersPaul Chapman scores a behind from a Stoppage. BEHIND SaintsJosh Saunders scores a behind from a Turnover. BEHIND SaintsAhmed Saad scores a behind from a Turnover. Former Saint Clinton Jones has started strongly for Essendon, collecting three disposals within the first four minutes of the game. Essendon has 13 top up players playing today's game. The AFL listed players named today have played a total of just 77 games between them for the club. 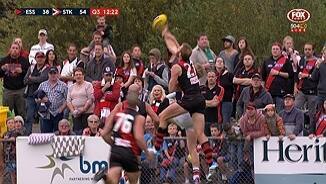 Welcome to Morwell Recreation Reserve for the Essendon v St Kilda Round 2 clash. 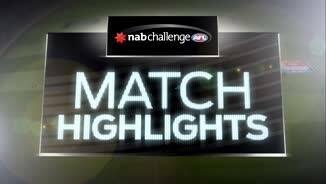 Match highlights: Bombers v Saints Essendon and St Kilda head to Morwell Recreation Reserve in the NAB Challenge. 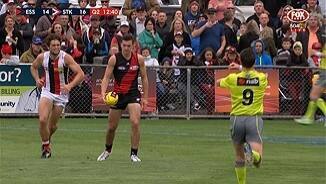 JAMES Hird returned from his coaching suspension to be stationed in a corrugated iron booth, Brendon Goddard watched on from the stands and few fans at the ground knew which Essendon player had the ball without a quick look at their AFL Record. To say Saturday's NAB Challenge clash in Morwell was a little unusual wouldn't quite cut it. The Bombers' makeshift pre-season line-up began its campaign against St Kilda with a 50-point loss, and although scrappy, defensively minded and largely uneventful, the contest will go down as one of the more remarkable in the modern game. It was always going to be the case. 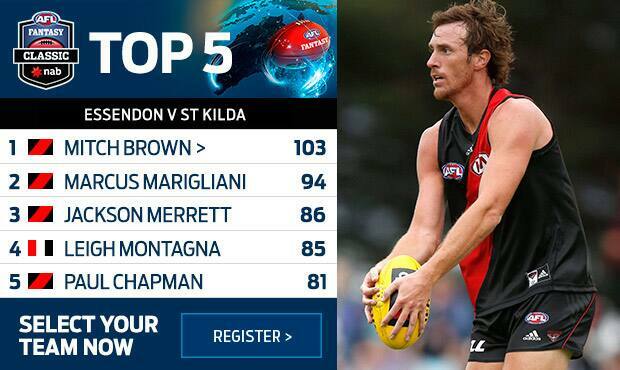 Three weeks ago, most of the Bombers' 13 top-up players were strangers to each other – and the Essendon list. But in front of nearly 6000 local fans and under dimmed lights, they began their unlikely stint as teammates. And although they lost – the Saints triumphing 0.15.11 (101) to 0.8.3 (51) – it was not a matter of effort. Wearing jumper No.72, Clint Jones, playing against his old team, showed he could still find the ball, gathered 22 disposals and offered a hard body inside the contest. Marcus Marigliani, who played two games for the Bombers in 2010, also found 22. In defence, former Cat Mitch Brown competed well and offered a calm presence (he took 10 marks and had six rebound 50s), while ex-Demon James Magner was tough and hard when the ball was there to win. They showed the Essendon coaching staff they were there to help the inexperienced and youth-filled squad, which had 21 of its 2012-listed players unavailable as the club awaits the verdict of the AFL's Anti-Doping Tribunal, which is expected later this month. Another handful of recent recruits, including Goddard, Joe Daniher and Zach Merrett, were on hand to support in the crowd after not being selected. The Saints did what they needed in a game they had to win. After a tight first term they kicked four goals to one in the second quarter to open a lead, and from there they maintained it and held off the Bombers, who pressed in the third quarter. Alan Richardson's developing side slammed on six goals to one in the final term to claim its first win after a narrow loss to the Brisbane Lions last week in Townsville. It was the usual suspects rather than the new faces who shone in the defensive arm-wrestle. Jack Steven found his zip and had 22 disposals, including three centre clearances, while veteran midfielder Leigh Montagna led the way with 27. Stand-in captain Jarryn Geary was solid, and second-year midfielder Luke Dunstan was also able to have an influence in his first game of the season after missing last week with an ankle injury. Dunstan limped from the field with a leg complaint in the third but returned in the fourth term and helped set up a goal for his team. The diagnosis was less positive for midfielder Seb Ross, who left the field in the third term appearing to have injured his hamstring. He walked dejectedly from the ground to the interchange bench, continuing the club's recent spate of hamstring injuries, which have claimed Jack Billings and Farren Ray. 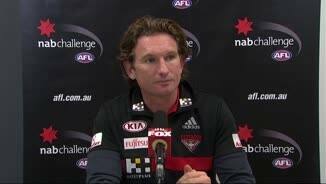 Essendon: It would have been hard for the Essendon coaching staff to find much of value out of the pre-season contest. But the club's enthusiasm in Jason Ashby was justified, with the half-back putting in a sound showing. Heading into his third AFL season, Ashby looked poised and in control across the backline and wing. So did Martin Gleeson, who managed to find 20 disposals. The pair both debuted under coach Mark Thompson last year, so would have given Hird some optimism. Jackson Merrett's decision to play in the NAB Challenge (despite being a 2012-listed player) also paid off as he picked up 27 disposals in a polished display through the midfield. Jonathan Giles, with three goals, also showed he will be able to move into the forward line as well as contribute in the ruck this year and help fill the void left by Paddy Ryder. Essendon: We'll stick with the actual listed Bombers here. First-round draft pick Kyle Langford has generated some excitement this year at Essendon and started deep in attack. He found space early on and was rewarded on the lead, but he sprayed his shot at goal. Father-son rookie Jake Long was lively and creative, and Irish recruit Conor McKenna will no doubt get his head more around the rules as his career unfolds. In the second quarter the Saints kicked a goal after McKenna gave away a free kick for running too far, and then two 50-metre penalties for not quite understanding the intricate elements of the rules. St Kilda: Hugh Goddard played his first game for the Saints after being left out of last week's team, and started in defence against Bomber Shaun McKernan. Goddard, pick 21 at last year's NAB AFL Draft, used his body well and competed strongly. He also appeared comfortable pushing a little further up the ground and giving some rebound. No.1 pick Paddy McCartin had a quiet day but took a nice mark on the lead in the first term and converted his shot at goal. Rookie Jack Sinclair started as a substitute but came on to kick a goal, and Jack Lonie offered some spark in the forward line with 17 disposals and a goal. Essendon: Mitch Clisby replaced Sam Tagliabue in the third quarter; Aaron Heppell replaced Jordan Schroder in the third quarter.